“For almost a year, Connie Yates and Chris Gard have experienced every parent’s worst nightmare,” said Elisha Waldman in The New York Times. Their 11-month-old son, Charlie, was born with a rare genetic disorder called mitochondrial DNA depletion syndrome, whose symptoms “are straightforward and brutal.” Charlie is blind and deaf; can’t eat, breathe, or move on his own; and has severe brain damage. 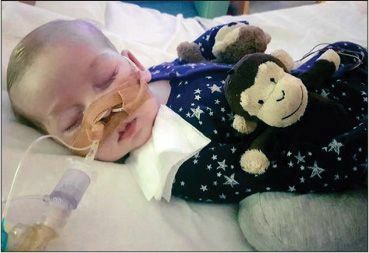 The British child is now at the center of an ethical maelstrom after London’s Great Ormond Street Hospital decided to turn off his life support—prompting an anguished legal battle by his parents. They have raised $1.7 million to take him to the U.S. to try an experimental drug. But the hospital and Britain’s National Health Service (NHS) have so far won the support of the courts in the U.K., which agree that additional treatment would only serve to prolong Charlie’s suffering without offering hope. This Gard story is a heartrending illustration of the “dangers of socialized medicine,” said Nicole Russell in TheFederalist.com. The NHS is having a severe budget crisis, so it’s not surprising it would seek to cut costs by letting an infant die, “even against his parents’ wishes.” In a government- run system, “the state knows best,” and the state has decided that Charlie’s “quality of life” doesn’t merit any more spending. In the brave new world of secular culture, said Jeff Cimmino in NationalReview.com, “lives are increasingly subject to utilitarian calculations.” It’s a slippery slope, with euthanasia the next logical step.